Intuitive Eating is a wonderful way to approach eating. With the support of others on a similar journey, we will explore the 10 principles together in a welcoming and safe space. Whether you are new to Intuitive Eating or have been moving towards this on your own for a while. Facilitated by Suzanne Dietrich, BA, RD & Dana Rourke, RHN, CYT, Certified Body Trust Provider. 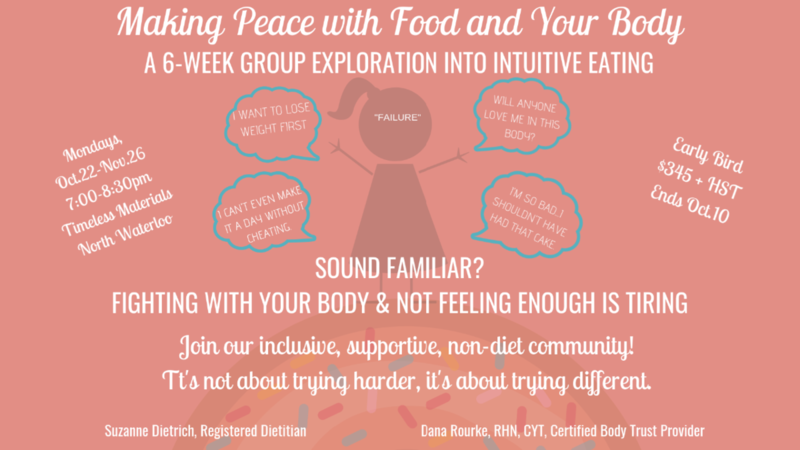 Are you ready to learn to trust and listen to your body around food? Are you ready to unlearn myths about food, bodies, health and dieting? Are you ready to experience more joy, pleasure and freedom? Sign up here to keep up to date on the next group session!